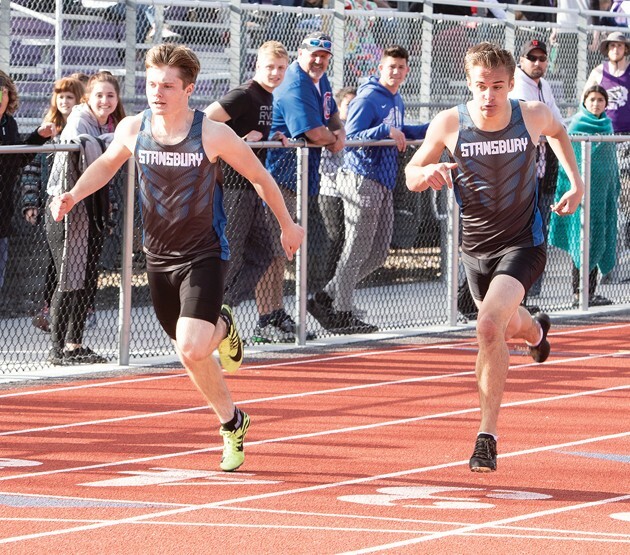 Stansbury’s Brenden VanCooney and Xander Littlefield make up half of the Stallions’ top-ranked 4x100-meter relay team. The high school track and field championship meet is more than a month away, and athletes all over Utah are working their way into top form. Athletes from Stansbury, Tooele and Grantsville are no exception, and a number of them find themselves among the top competitors in their respective events through the first half of the season. Tooele’s Aaron Pectol is ranked first in Class 4A in the boys’ 400-meter dash with a top time of 50.57 second, while Grantsville’s Jeffrey Yadon is first in Class 3A in the boys’ high jump (6 feet, 0 inches) and Tooele’s Sammy Thomas is first in 4A in the girls’ discus (123-8). Grantsville’s Ashlee Edwards ranks first in 3A in the girls’ long jump (17-6). Stansbury’s boys 4×100-meter relay team of Brenden VanCooney, Jet Richins, Xander Littlefield and Silas Young is ranked first in 4A with a time of 43.21, and Grantsville’s sprint medley relay team is ranked first in 3A with a time of 3:48.70. Young ranks second in 4A in the boys’ 100-meter dash (11.12) and sixth in the 200 (22.97). Littlefield is fifth in the 400 (51.29), and Jared Brown is second in the discus (151-6) and fourth in the shot put (49-10). Josh Oblad ranks seventh in the 800 (1:59.74) and 1,600 (4:30.05). Carson Belnap is sixth in the 800 (1:59.35) and ninth in the 1,600 (4:31.01). Stansbury ranks fifth in the 4×400 relay with a time of 3:30.93. Pectol is also part of Tooele’s fourth-ranked 4×100 relay with Joseph Wilkins, Justin Rogers and Gavin Ware (44.04). The same foursome makes up the Buffs’ sixth-ranked 4×400 relay (3:30.99). Rogers is seventh in the 110 high hurdles (15.91), and Jared Downard is ninth in the 300 hurdles (42.31). Grantsville’s Porter Whitworth (4:41.00 in the 1,600) and Daltyn Peasnall (150-10 in the javelin) are ranked fourth in 3A in their respective events. The Cowboys’ 4×400 relay is ranked eighth with a time of 3:47.54, and Branson Yager is ranked eighth in the shot put with a mark of 39-11. James Fuluvaka’s season-best mark of 135-4 in the javelin has him ranked No. 10 in Class 3A. Tooele’s Makenna McCloy is ranked second in Class 4A in the girls’ 200-meter dash (25.81) and fourth in the 100 (12.73). She is the anchor leg on the Buffs’ 4×100 relay team, teaming with Allison Smith, Aysha Lewis and Julia Smith for a time of 50.55 that has Tooele ranked second in 4A. Lewis is fourth in the long jump with a mark of 16-7. Stansbury’s Aubree Cheney is ranked fourth in the 400 with a time of 58.85, and Mackenna Sargent is fourth in the shot put with a mark of 33-9. Grantsville’s Danielle Hunsaker is ranked in the top-10 in 3A in three events: the 200 (fourth, 27.03); the long jump (fourth, 16-8 1/2) and the 100 (10th, 13.37). Jade Garcia is ranked second in the javelin (110-10) and Erin Hurst is fourth in the 100 hurdles (16.62). Hillary Cloward is eighth in the javelin (101-2), Sydney Killian is ninth in the discus (90-10) and Chloe Gowans is 10th in the javelin (95-5).